We will use the Best Resume Format as per your current job situation & Industry. Check out our Affordable Rates for Resume Writing, LinkedIn Profile Optimization, Cover Letters etc. Check out our Affordable Rates for SOP Writing, College Admission Essays, Reference Letters etc. Want to Land a Job Through LinkedIn? Check out our Writing Services - Click Here! We are 100% sure about our quality and affordable cost. We offer our customers a 30 days guarantee with absolutely No questions asked. 5: We shall deliver the Final Draft within 2 to 5 business days. Order your Professional Resume today! The More Interviews you get the more are your chances to succeed in securing employment. "A resume is an advertisement designed to get you an interview call". Find out why a highly impressive Resume prepared by our Professional Resume Writers can help you to secure more Job interview calls. Want to know why you are not getting any job interview calls? Request a Free! Resume Review - Just attach your existing resume or CV in your email & send it to us. In this competitive, internet-driven world of employment searches, your resume represents you to potential employers. It serves as your tool to attract attention, get the interview. A High impact resume crafted by our expert resume writers will make you stand out from other candidates by showcasing your Skills and Aptitudes. Your Resume is your sales pitch – you need to sell yourself in the best possible way. Our resume writers Invest a lot of time and research into developing it. Our make sure that your resume is error free – double check your grammar and spelling, make sure that all company and school names and cities are spelled correctly. If it contains errors, no matter how minimal, it will give your potential employer an impression that you do not pay attention to detail, that you don not devote enough time to double check your work, and also, that you are an ineffective communicator. A well formatted resume would catch the employers eye and would give a distinct impression that you pay great attention to detail. You must use Times New Roman and Ariel only, as these are the standard basic fonts. Use only the standard font size and colours. Never use large fonts, multi-colours, bold, italicized, or large-cap text. Keep your format consistent and make sure that the resume looks great when viewed online as well as after it is printed out. Our Professional Resume Writers limit the size of your Resume to one or two pages only - any additional pages could give an impression that you either don’t know how to concisely summarize your education and experience, or that you are listing unnecessary information for the sake of taking up space. 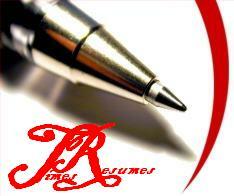 If you have never written a resume before, you must hire professional resume writing services to craft it for you. A well-written resume can make a difference between being stuck at your current employment and getting an interview to land the employment in the industry of your choice. What is a Resume and why is it essential for your career progression?